How do you get 560 calories into a 16 ounce drink? That takes the talent of a major global corporation: McDonald's (of course). A Coke has a mere 200 calories for 16 ounces, and it is looking good right now compared to the McDonald's Frappe՛. Why does Snack Girl keep picking on McDonald's? (remember McDonald's Burger Left for Two Weeks?) I believe it is because I cannot defend myself from their marketing juggernaut. Their Frappe՛is on billboards, on the radio, on the internet, and I even heard they were giving out FREE ones at my local McD's. How is a girl supposed to avoid all that advertising? I succumbed one day when my kids asked to go to the famous McD's play space. It is a rare treat, and I get to listen to traffic while they scream delightedly at going down a long covered slide. Also, I wanted to try this Frappe՛. I figured I needed a coffee and it was my snack time. Usually, my snack time has about 100 to 200 calories depending on how hungry I am and what I had for lunch. When I asked at the counter, they didn't know how many calories were in the Frappe՛(and they didn't know what was in it). It tasted delicious. The mixologists at McDonald's really know their stuff. When I came home, I checked the calorie content and was absolutely blown away. 560 CALORIES, 24 GRAMS OF FAT, 70 GRAMS OF SUGAR - wow! Honestly, I thought I was ordering a coffee drink with some added sugar - not a CREAM drink with some added coffee!!!! And, it takes talent to get high fructose corn syrup listed 3 times on an ingredient list. I believe McDonald's has started the McCafe՛to compete with Starbucks. And, the drinks at Starbucks can be notoriously fatty and high calorie. BUT, Starbucks has their ingredients and calorie amounts listed at the store. The McDonald's here in Massachusetts did not. Again, I had no way to assess the damage before I tried the stuff. My advice is to stay FAR AWAY from the Frappe՛ and stick with Coffee. Anyone else try the McDonald's Frappe՛ What did you think? Water, cream, sugar, milk, high fructose corn syrup, coffee extract, natural (botanical source) and artificial flavors, cocoa (processed with alkali), mono- and diglycerides, guar gum, potassium phosphate, disodium phosphate, carrageenan, carob bean gum, colored with (red 40, yellow 5, blue 1). Cream, nonfat milk, water, corn syrup, sugar, high fructose corn syrup, mono-and diglycerides, carrageenan, polysorbate 80, beta carotene (color), natural (dairy and vegetable source) and artificial flavor, mixed tocopherols (vitamin E) to protect flavor. Whipping Propellant (nitrous oxide). Corn syrup, water, hydrogenated coconut oil, high fructose corn syrup, glycerin, nonfat milk, cocoa powder, cocoa (processed with alkali), food starch-modified, disodium phosphate, potassium sorbate (preservative), xanthan gum, artificial flavor (vanillin), salt, soy lecithin. The was a coupon in the Sunday paper for a free smoothie at McD's. I saved it to use on my trip (figured to cash it in in the airport) but forgot to take it and can't find it now. I figured their fruit smoothie couldn't be too dangerous, but now I wonder. In all fairness to your Blog v. MickyD - you did speak well of McDonald's southwest salad not that long ago. So it's not all anti-McD. I have tried their mocha frappes, and I like them, but not enough to consume that much junk and that many calories. I get my SEC McMuffin fix once per week, but the sandwich is all I get. A tall caffe mocha at Starbucks is only 200 cal. Put some ice in it and be happy! and their smoothies have no HFCS but are made with juice and sugar around 210 calories for 12 ounces. I have not tried the McD version. But one think I do like about Starbucks is they do offer a light frapp. And it's only a couple of ww points if you get it without the whipped cream. As a coffee snob.... yucko! They should not be allowed to market that slop as a coffee drink! I'm a fan of McD's SF FF vanilla iced lattes. Only 110 calories and made with FF milk. A nice start to my mornings. Oh crude! I had a feeling that this thing and the iced coffee too were way too many calories. Every time I drink one I get a little nauseous, but I kept going back for more. Thanks for the tip! This is over, plus I'm telling my readers. I feel fortunate at this point that most of these drinks taste way to sweet for me and I just avoid them. I'm a fan of the iced coffee at McD's (or Starbucks or DD or anywhere...) since I can get it with skim milk. Man, I just had one a few weeks ago (got it free with insert from the Sunday paper). I wonder what the calorie/fat content is without the whipped cream? I'm guessing a lot better. I'm a fan of some of the new drinks they have that are customizable (can pick the milk in lattes, etc). It's 16 ounces of heaven in my mouth. Used to splurge several times a week. But I haven't had one since finding out about the gross amount of fat and calories. I'm sure my Starbucks go-to's are almost as bad, but at least I can get them skim. thanks for the warning I refuse to go within 100 feet of McD's because i used to be an addict of their BigMac and French fries but that was long ago and far away I now get sick if I even smell McD's it is toxic puke! Oh my gosh, I was at a weight watchers meeting and I got one of those and someone asked me how many points and I said I didn't know because that was my treat after I weighed in. I agree with Jackie, past tense. Just a bit of information: McDonald's (MCD) closed today at $72.92. It's almost a record high. Moral of the story. Sad, but true, people, worldwide are lovin' it. Thank you so much! I haven't graced a McDonalds since watching "Super Size Me" a few years ago, but I must admit, I was tempted by the bombardment of frappé ads. Woo, that was a close one. 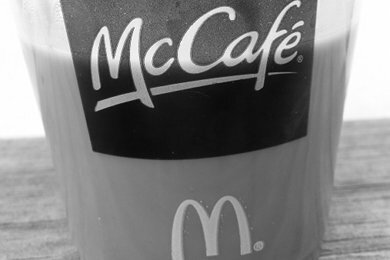 I ordered an iced coffee at a McDonald's at a roadside toll plaza this weekend and was blown away by how bad (and for you) it was! It looked and tasted like a half gallon of milk with a few teaspoons of instant coffee and a cup of sugar. I ended up tossing it : ( And the menu called it coffee! Man, that makes me REALLY GLAD that I don't drink coffee (in any of it's many incarnations). Never developed a taste for it. My husband tells me to grow up. I tell him to *&^% off. It all works out in the end.